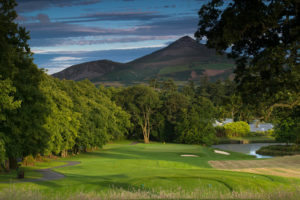 With Two Championship golf courses set in stunning surrounds at the world renowned Powerscourt Estate, Powerscourt Golf Club is an immensely popular venue. The 36 hole championship lay out ensures availability 7 days a week for both members and visitors, add to that friendly staff, outstanding facilities and excellent dining, and it’s not hard to see why so many flock to the Estate. 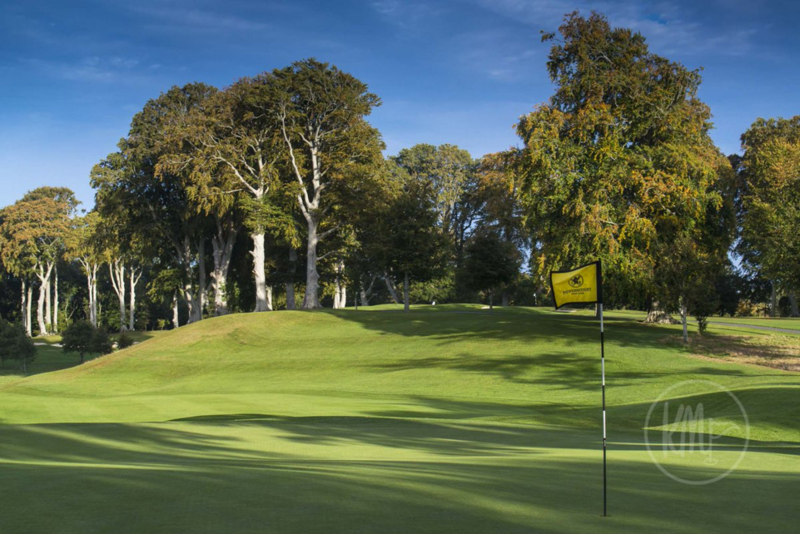 The East Course at Powerscourt offers something for everyone, with the traditional mix of four Par 3’s & Par 5’s, and 10 Par 4’s. It is an incredibly enjoyable round of golf, with 3 of the par 3’s playing downhill, and the fourth and signature Par 3, the 16th hole, playing over water. It is a strong but fair test, with two tier greens on many holes, but the option to ‘miss’ on one side almost always available. As good as the opening 3 holes are, the course peaks brilliantly for the closing stretch. The aforementioned Par 3 16th offers equal chance to make birdie or bogey, while the 17th is a true Par 5, with not even the biggest of hitters likely to take on a carry over water to a shallow green with bunkers at the back. The 18th hole gives golfers one last breath-taking view of the Estate and its stunning surrounds from the tee box, before one of the most challenging tee shots of the day. A long fairway bunker on the left, as well as the direction of the green, makes the right side of the 18th fairway the ideal line. Push it too far right however, and water awaits. If you have taken your opportunities to score well earlier in the round, you’ll happily take a par here and head to the 19th hole as happy as can be! The West Course offers a completely different feel and test, bringing David Mclay Kidd’s (Bandon Dunes in Oregon, Castle Course at St. Andrew’s) experience and detail for a challenging, rewarding and highly enjoyable golf course to life. The beautiful scenery and greens from the West course will often be talked about from visitors who want a second chance at it. From the opening Par 5 playing from in front of the iconic Powerscourt House, this is a fantastic test. The outstanding feature of the West Course is large and undulating greens, finding the right side and level with your approach shot is key to getting around here well. Find yourself in the wrong spot and fast downhill chips, or deep bunkers await. Again this course at Powerscourt is a fantastic mix of holes, with challenging Par 3’s and long Par 5’s before saving the best ‘til last with 16, 17 and 18. The Par 5 16th Hole is a 542 yard dog leg, with bunkers all along the left to ensure any thoughts of short cutting the distance will be quickly dispelled. The Par 3 17th is a long drop downhill from Tee to Green, judging the effect the drop has on your club choice is where this hole is won or lost. From there the 18th tee box again offers a spectacular vista of the Powerscourt Estate, before the Par 5 finish this time offers a chance to finish strong with the potential of a birdie… if water is avoided! 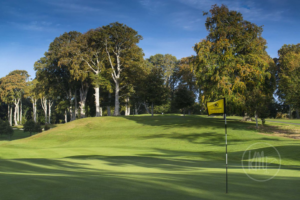 Both courses are immaculately presented, with some of the best kept greens around. Talk to their dedicated booking team about your visit.